Goldsmith Amsterdam - Oogst, handmade jewellery and wedding rings. 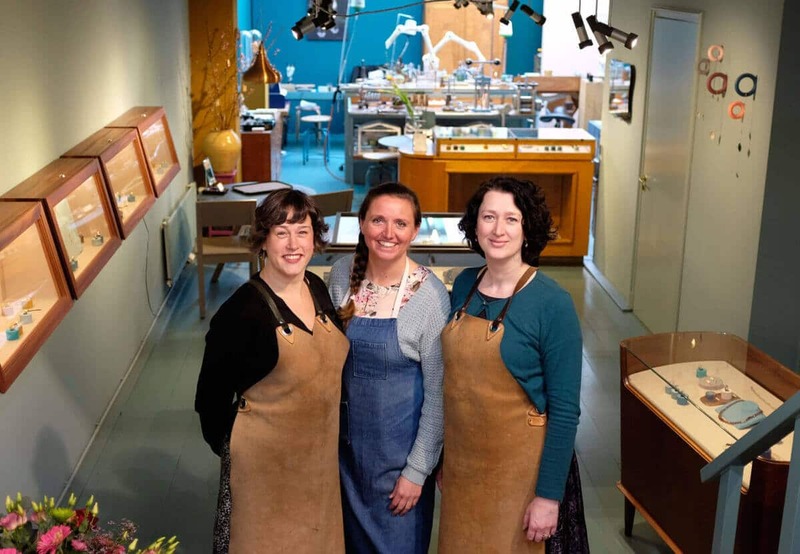 Goldsmith Oogst in Amsterdam is the perfect partner for everyone who likes beautiful, handcrafted jewellery. Nicely tucked away in the Amsterdam Jordaan goldsmiths Ellen and Lotte transform your idea into a carefully crafted masterpiece! Are you looking for wedding rings that match your style and personality? Have your rings custom designed by goldsmith Oogst in Amsterdam. Or choose original wedding bands from our handmade Oogst collection: a range of textures and rugged hammering, flowy shapes and clean-cut lines, with sophisticated hand engravings and sparkly diamonds. Custom made jewellery is the specialty of goldsmith Oogst. With great pleasure we will design a perfectly befitting one-of-a-kind piece for you in our refined style. A celebratory push present, a jewel made from cherished heirlooms, a custom made present featuring stunning gemstones or sparkling diamonds or a special commemorative jewel. Hand made in our goldsmith studio especially for you. From a precious heirloom to a modern classic. Goldsmith Oogst can transform and breath new life in your old jewellery. We will re-use the gold, silver and gemstones, or we will respectfully rework the elements of your own pieces. This way we will create a new piece of jewellery that works with your style and personality. Beautiful, handmade jewellery in gold or silver, created in our goldsmith studio in Amsterdam. With sparkly gemstones, natural shapes combined with clean lines, or elegant hand engraving. Modern classics and real eye catchers go hand in hand with timeless and subtile pieces in our collection. Nice to give or to get. Ready to pop the question? Goldsmith Oogst is thé place to find an exclusive, hand made engagement ring matching her personality. An exceptional diamond or an extraordinary precious stone will add extra sparkle to this ring. From elegant and fun to distinctive and clean-cut, you can find it all in our collection, created here in our goldsmith studio in Amsterdam. Or have a ring custom designed for you in our refined and slightly nostalgic style. Goldsmith Oogst works with recycled gold and conflict free diamonds. You are also very welcome to bring your own gold or precious stones to the studio for us to work with. Curious what we can create for you? Have a look at all the pictures for inspiration and make an appointment. We are happy to advice you about your new Oogst piece or to discuss your wishes for your own custom Oogst design at the studio in the Tweede Tuindwarsstraat 8 in Amsterdam.